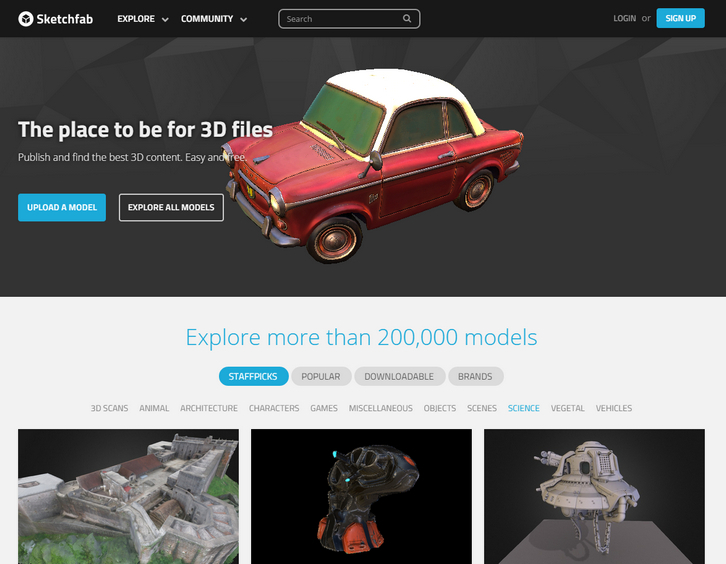 Sketchfab is the leading platform to publish, share and embed interactive 3D content, anywhere online. Millions of people make 3D models or scan the real world in 3D, why would they share this in 2D? What YouTube did for video makers, or SoundCloud for musicians, Sketchfab wants to do for creators of 3D content. You can upload files in almost any 3D format, directly on sketchfab.com or using one of their exporters, in order to upload from your favorite 3D creation tool. Once your models are on Sketchfab, you can embed them on any web page, and share them on other platforms like Tumblr, WordPress, Bēhance, Facebook, Kickstarter, LinkedIn, deviantART.